The publication in 1988 of Salman Rushdie's novel The Satanic Verses triggered a furor that pitted much of the Islamic world against the West over issues of blasphemy and freedom of expression. The controversy soon took on the aspect of a confrontation of civilizations, provoking powerful emotions on a global level. It involved censorship, protests, riots, a break in diplomatic relations, culminating in the notorious Iranian edict calling for the death of the novelist. 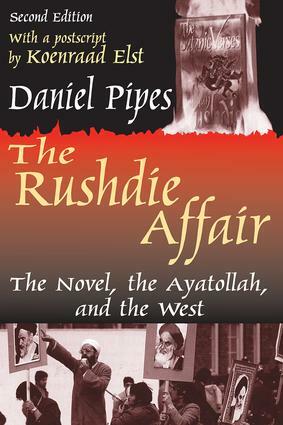 In The Rushdie Affair, Daniel Pipes explains why the publication of The Satanic Verses became a cataclysmic event with far-reaching political and social consequences.Pipes looks at the Rushdie affair in both its political and cultural aspects and shows in considerable detail what the fundamentalists perceived as so offensive in The Satanic Verses as against what Rushdie's novel actually said. Pipes explains how the book created a new crisis between Iran and the West at the time--disrupting international diplomacy, billions of dollars in trade, and prospects for the release of Western hostages in Lebanon.Pipes maps out the long-term implications of the crisis. If the Ayatollah so easily intimidated the West, can others do the same? Can millions of fundamentalist Muslims now living in the United States and Europe possibly be assimilated into a culture so alien to them? Insightful and brilliantly written, this volume provides a full understanding of one of the most significant events in recent years. Koenraad Elst's postscript reviews the enduring impact of the Rushdie affair. How Is the Book Blasphemous? Blame Rushdie for the Furor?